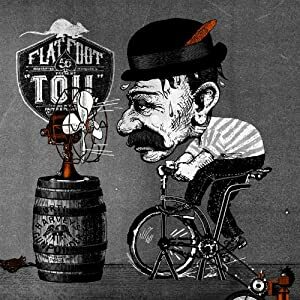 Flatfoot 56’s new release, Toil, takes off where Black Thorn left off. The 2010 release of Black Thorn, produced by Johnny Rioux of Street Dogs fame, showed off the maturing off the band with smart lyrics and musical craftsmanship. Toil continues the trend with each song being a well crafted piece of work. In many reviews of Celtic Punk, bands seem to be always compared to DKM and Flogging Molly – I can kind of understand for the those just entering the genre, but there is no comparing Flatfoot 56 to either of those bands, their sound is their own. In the first listening, the energy and the melodies carry you through them album, second listen, start paying to attention to the lyrics and the intelligence and deftness that they contain. The songs contain elements that make it easy to relate to. Flatfoot 56 has made it difficult to pick some tracks to highlight! They each have their own bit of greatness. From the fast ripping pace of Brother, Brother to I’ll Fly Away are all great. This album is good for simple rocking out but yet when you are in the mood for thoughtful lyrics, you will find gems in every song! This album is in my opinion a must have and I highly recommend you buy it as soon as possible!